Part of my job at Happy Apple Quilts is to find ways to promote the fabrics. Often I search fabric companies Facebook pages, Instagram’s, and websites to find what the designers are doing with their fabric. This is how I first learned about the Moda Bella Challenge! My store carries Moda Bella as one of our favorite solids. We created a nice display with the challenge information to help sell the fabric. I even took the challenge a step further and my guild, the Tampa Modern Quilt Guild decided for this year our quilt challenge to be a solids challenge! Members could enter into the official Moda Bella or use any solids of their own choosing. Finally, it was my turn to decide what to create! This year I have been really focusing on using my stash and creating scrap quilts, so this was an interesting challenge. 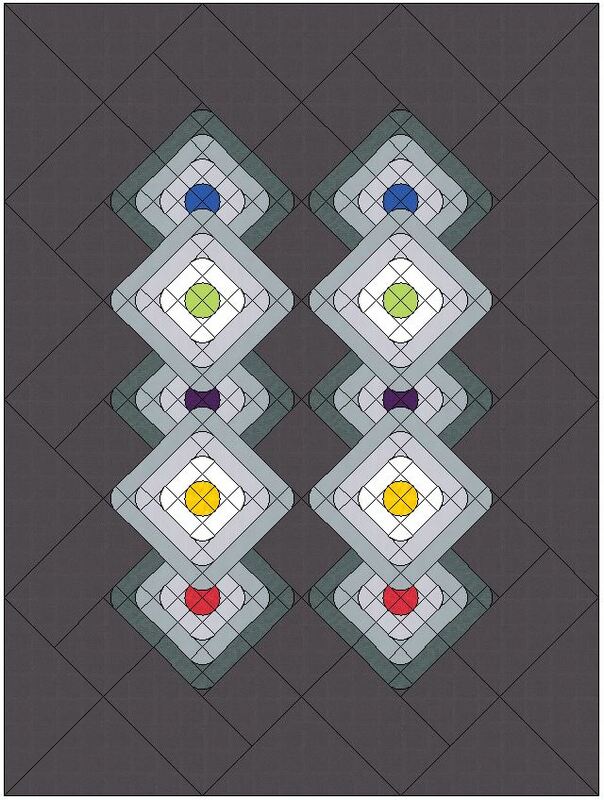 I really thought of this challenge as a pattern design, not necessarily an art quilt (which the winning quilts are just stunning~). The requirements were to use all 12 Moda Bella solids, and not necessarily on the front. 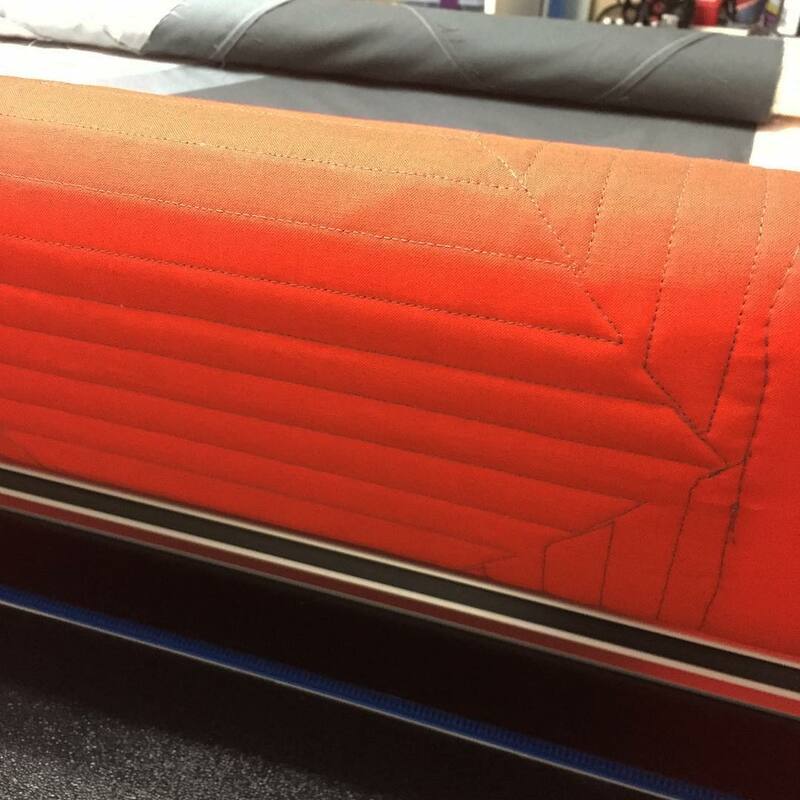 Which is funny because I love the color orange, but the Moda Bella Mango is really vibrant. It became the back of my quilt! Since the quilt needed to be 72″ x 90″, ~which is so big~ I wanted to use large blocks to make an impact. The many values of grey gave me an idea of creating an illusion of depth where the color would be small pops of focus. I played with layouts and decided that putting the blocks on point added the dimension I was looking for. Now to be true, I am not an expert on EQ7! I did load in the specific Moda Bella colors to the fabric library. 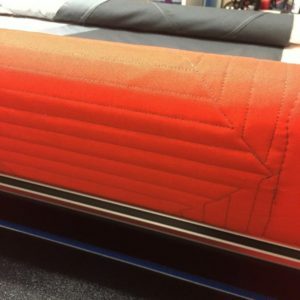 I created the design I wanted, but couldn’t figure out how to shrink it to the exact size I needed without creating crazy pieces that required 4 7/8″ strips or likewise. You know those patterns. Cut something with a 7/8″ on it? Yeah, not doing that! So I actually made the quilt bigger than it needed to be and trimmed the background down when it was complete! I printed out my EQ7 fabric yardage and the templates for my Drunkard Path corners. The only challenge of putting it together was the quilt is bigger than my design wall! Now to the best part, the quilting! It seemed online that there were a few posts about the Moda Bella Challenge, but very few were showing it. Secrecy until the end I guess? So I kept my design behind the camera until after I submitted it. I quilted ruler work in the background to emulate to on-point blocks and free motion in each strip. Not perfect by any means, but I was very happy with. Then the waiting game! 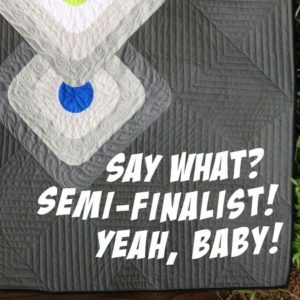 After a few weeks I was incredibly excited to hear my quilt was going to Moda for final judging! Everything felt like something amazing could happen! 84 quilters entered quilts, and Moda chose 19 to bring in for judging. Now to wait for the final results, which unfortunately I did not make the top three. My major disappointment wasn’t loosing out on the reward, but I knew I was going to Quilt Market for the very first time and to see my quilt hang in Moda’s Booth would have been incredible! 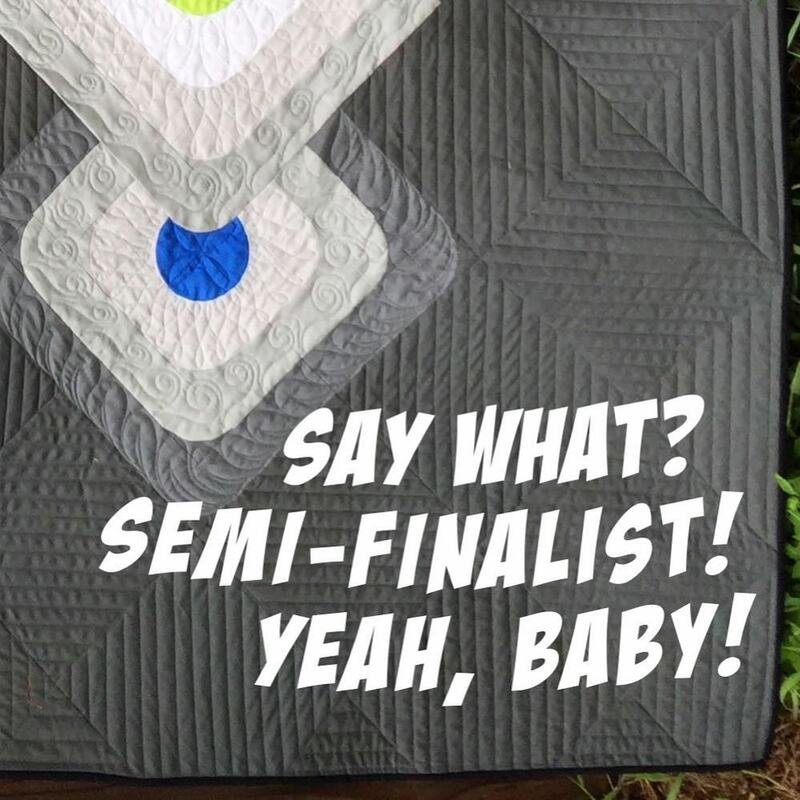 But the top three are over the top amazing quilts and they deserve their rewards! See the winners and the 19 semifinalists HERE. 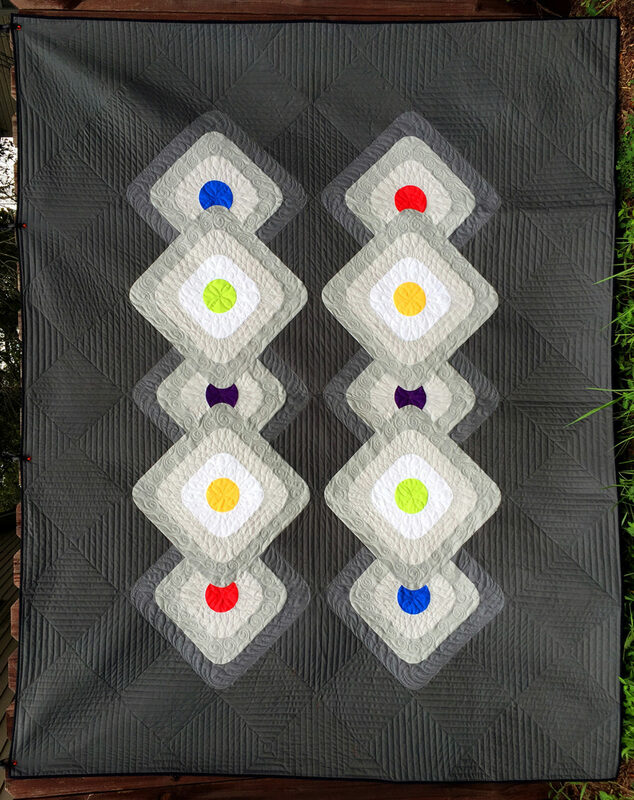 I named my quilt “Stepping Stones” for multiple reasons. Designing the visual itself, I felt I was creating a pathway. 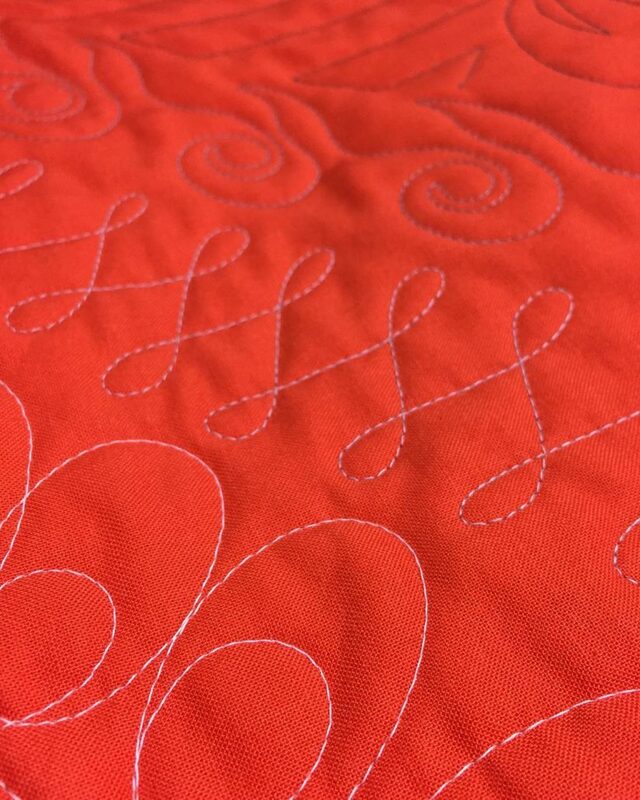 But going deeper, it will take many little steps to get to where I want to truly be in quilting and designing. 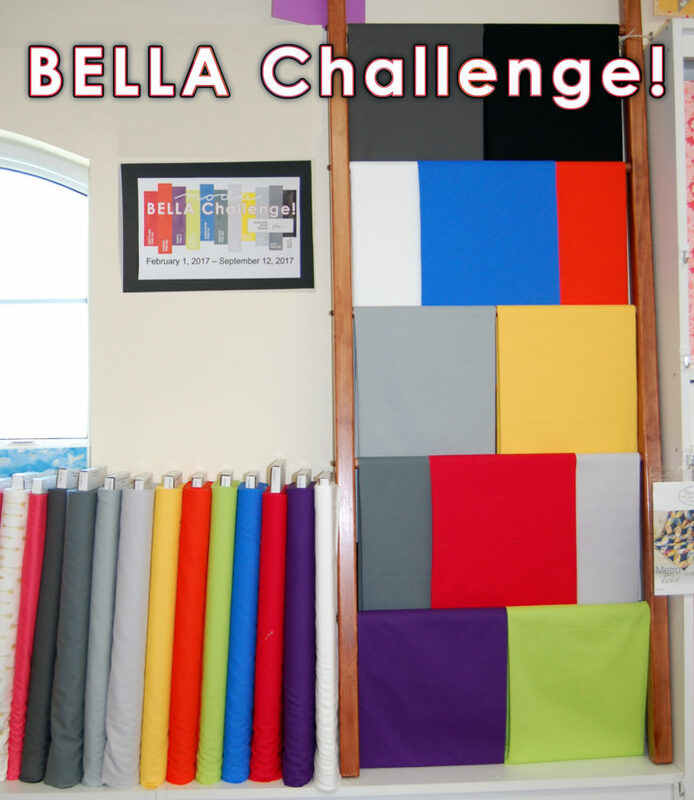 The Moda Bella Challenge was a great way to design a quilt this year. Many, many thanks to Moda United Notions for the challenge and I hope they do another one next year! And for the goodie bag and gift that arrived back with my quilt, I am super excited! Moda is such a wonderful company!